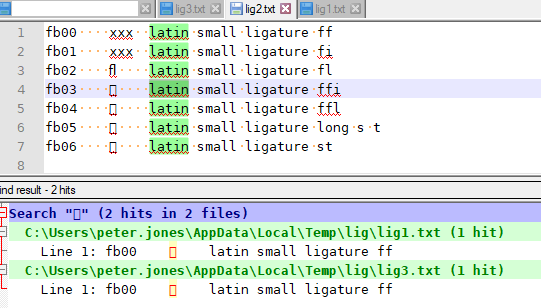 Serching ligature "ﬀ" find also non ligature "ff"
I’m searching the single character “ﬀ” (LATIN SMALL LIGATURE FF) in multiple files, but as result I obtain also the files containing two ordinary f “ff”. The same happens with “ﬄ” and “ﬃ”. Depending of your current font used in Notepad, you may not see all these characters. For instance, with my current mono-spaced Courrier New font, only the ﬁ and ﬂ are correctly displayed ! Of course, don’t forget to set the Regular expression search mode, in the Find/Replace dialog ! So, are you complaining that when you highlight the ligature, it also highlights the non-ligature versions? 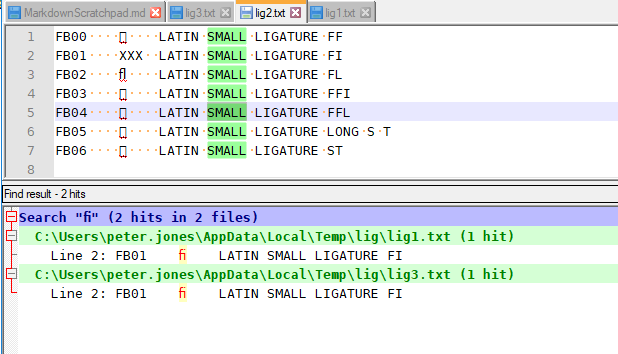 If not, I had thought maybe you were trying to say that Find In Files dialog was behaving differently than the normal Find dialog… But when I make three files in a “lig” subdirectory: “lig1.txt”, “lig2.txt”, and “lig3.txt”, where 1 and 3 are identical to above, and lig2 does not include the text ﬁ, but does contain the text FI, it correctly says that “lig2.txt” does not contain the ﬁ. But searching that for ﬀ still only finds hits in “lig1” and “lig3”, and no hits in “lig2”. I cannot replicate anything where it does the match incorrectly “in multiple files”. Could you provide a couple example files that match for you, and the exact conditions under which you search for them and it finds them? If that’s annoying, you could turn off the Settings > Preferences > Highlighting > Smart Highlighting > ☐ Enable … but then highlighting something else (such as SMALL in the example text) would also not highlight the other matches. Then you can select the ﬂ ligature, and it only highlights the ﬂ ligatures, but not fl or FL; similarly, selecting fl will only find the two lower-case letters, and not ﬂ or FL; similarly selecting FL matches only two-capitals, not ﬂ or fl. If it’s the smart-highlighting, then requiring it to match case will prevent extra selection. If it’s either the Find or Find In Files dialogs, I cannot replicate your results, so if you need more help, you’ll have to be more explicit about what’s going on. If your “in multiple files” is by some other method, you’ll definitely need to be more explicit.